Since we got our goats, I’ve been thinking a lot about my practice of eating meat. Our original intent was to raise the goats for both milk and meat, but it didn’t take long before we realized that this was going to be a lot easier in theory than in practice!!! Now that we’re interacting with and loving on them, I’m realizing that the idea of butchering one of these animals (or their offspring) is going to be very, very different than the actual practice of it. And I have to ask myself: can I do it? Should I do it? Of course, my personal version of schizophrenia comes into play here, because I’m perfectly okay eating meat that someone else has raised, so long as I don’t have to love on or care for the animals myself. Isn’t it incredible, what autonomy can do? But, as a friend recently pointed out to me, what if I could walk alongside every animal I eat – be a part of the cows life from the time she is born, to the time that she dies and love her as intimately as I love my dog our cat – to know the cow or chicken or deer as intimately as God knows him? Would I eat him then? Should I eat him then? And with that in mind, is it more right for me to eat someone else’s meat – meat taken from animals crowded into feedlots and poultry houses, subject to abuse by their handlers, fed massive quantities of foods they were never meant to eat – or to eat meat from an animal I have nurtured myself, an animal whom I have cared for and loved? Some, including the above quoter, would say I shouldn’t eat either. In Gods eyes, is the carrot any less valued than the cow? I think it’s easy for us to use typical arguments like “carrots don’t feel pain” or “carrots don’t have emotions” to justify our consumption of them versus the cow, but in God’s eyes is there a difference? Is the carrot any less loved by God than the cow? If I could see the carrot the way God sees it, what would I see? Would I still hesitate more at butchering the cow, than at harvesting the carrot? For reasons I can’t begin to understand, God has set us up in a world where living things must die so that other living things can live. Even humans are not exempt from this all-encompassing rule of nature. Every living thing, at some point, becomes food for another living thing. None of us can survive, otherwise. In light of this, my consumption of beef should make me value the carrot more, not less. It should make me more willing to raise my own animals for consumption, than to consume animals raised by others. In light of this, I believe I will not only be able to raise my own meats, vegetables, and fruits, but in doing so, I will be able to view all of God’s creation with just a little more awe, a little more humility, and a lot more love. When we raised chickens for meat, I really loved them. But strangely, it was my love for them that made me want even more to raise our own meat. Commercial chickens are so terribly mistreated. Our chickens lived a happy life with plenty of fresh air and sunshine. They were treated with gentleness from the day we got them. I didn’t want my grocery dollar going to support cruelty to these animals I had come to love and appreciate so much. I agree wholeheartedly, Andrea… I watched a movie not long ago that really brought the issue home for me – it was called “Earthlings.” Lots of stuff I don’t agree with in there (they come more from the standpoint that we should all be vegetarians) but it really opened my eyes to how some of these animals are treated – even more than Food Inc.
3 “You shall not eat any abomination. 4 These are the animals you may eat: the ox, the sheep, the goat, 5 the deer, the gazelle, the roebuck, the wild goat, the ibex,[a] the antelope, and the mountain sheep. 6 Every animal that parts the hoof and has the hoof cloven in two and chews the cud, among the animals, you may eat. 7 Yet of those that chew the cud or have the hoof cloven you shall not eat these: the camel, the hare, and the rock badger, because they chew the cud but do not part the hoof, are unclean for you. 8 And the pig, because it parts the hoof but does not chew the cud, is unclean for you. Their flesh you shall not eat, and their carcasses you shall not touch. I appreciate your honest reflections in this entry. While reading your entry a question that came to me was, Why is it that you feel a conflict of emotions initially with respect to butchering your own animals? From your entry I gather that you feel some apprehension. Do you think that this is perhaps because animals, as opposed to vegetables, can visibly reciprocate their affection and love for their caretakers, and it makes us rather guilty to, in some ways, betray the trust that such a relationship fosters? If not, what else do you think is behind this apprehension? It’s probably the fact that they can reciprocate affection plus the fact that we as humans can bond more with animals and become emotionally attached to them in ways we don’t with, say, a zucchini. I don’t really feel that I “betray their trust” in butchering them (if anything, I ensure the end of their life comes peacefully and without pain,) but to say it’s difficult to be the one responsible for ending the life of an animal you have an emotional attachment to is an extreme understatement. I think I can understand that if the animals need to be put down because they are suffering from, let’s say, a disease of some sort, or if the maintainers of these animals can’t maintain them no more due to financial difficulties. In essence, I can understand animals being put down because the caregivers don’t want the animal to suffer hardship. Euthanasia. However, I am unable to understand how when we enter into a reciprocal relationship with another living entity that has a personality of its own (and, thus, in some ways, a ‘person’), we can suddenly put an end to that relationship and eat the other person. It doesn’t seem either party benefits from such a transaction. And I think the emotional attachment that you mentioned would also exist in the animal, too. Then the animal would, consequently, feel shock as it is attached to someone who, all of a sudden, wants to end that relationship. This is what I meant by, ‘betray their trust.’ Just as in any human dealings we may have that consists of affectionate reciprocation we tend to trust the other person, I think the same seems to apply with reciprocal dealings with animals. What are your thoughts on this? I would appreciate your thoughts on these, and I wanted to ask whether you think the taste of meat has anything to do with your willingness to tolerate the feelings of apprehension that arise from butchering animals? Here are some of my thoughts after reading your comment and the article that you linked to your post. It may be possible to butcher an animal that you’ve shared a bond with by sending, for example, a bullet through his/her head, ending their life in an instant. There won’t be any time for that cow, sheep, or chicken to go through any emotional and physical torture. It won’t affect that animal, in our minds. But how does that change who *we* are? You clearly mention in the article about your gratitude towards Lucy, your cow. You also mention how she has showed her affection to you, as well. Clearly, you have a bond with Lucy. You outline how much Lucy trusts you. It would seem to me that if Lucy didn’t have the ailment that she has, you would have let her live her full life. But due to the ailment, and because you would like Lucy to be a ‘literal part of you,’ as you put it, butchering and eating her is the best way to go about making Lucy a part of you. By this line of reasoning, and I say this from an unbiased state of mind as I can be in, we could ask ourselves whether we would do the same for our loved ones who are human. To make them a literal part of us, will we eat them after their demise? Obviously not. But burying them doesn’t make us think about them and feel their presence any less as we sift through the photo albums or visit them at their spot in the cemetery. Even more so, we feel that they’re always with us in what they’ve taught us about life in a practical sense. 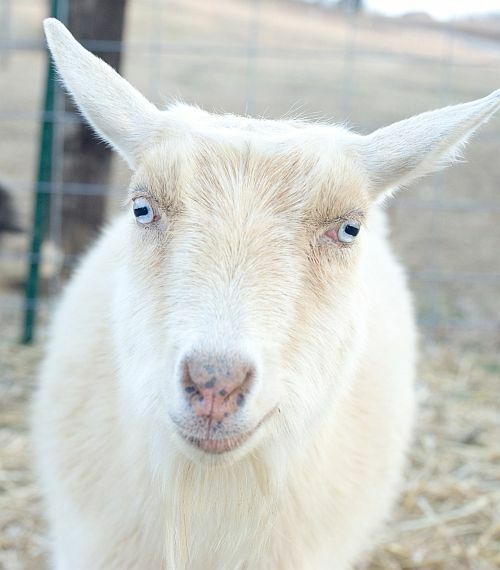 Yes, we can take Lucy, or any other animal, away from the eyes of other farm animals and put her down with little or no emotional and physical suffering to Lucy and the other animals at the farm. But in the process of doing that, how do we feel that we are about to part with an animal that has given us affection and sustenance? It seems to me that we are, really, butchering a part of ourselves that Lucy represented to us; that affectionate, innocent, caring part of ourselves. God has set us up in a world where living things must die so that other living things can live. The lion eats the zebra in a seemingly horrific battle between life and death because he was made to do so. If this seems cruel and wrong in my eyes, but not in God’s who made them, something is wrong with the way I’m seeing the world.